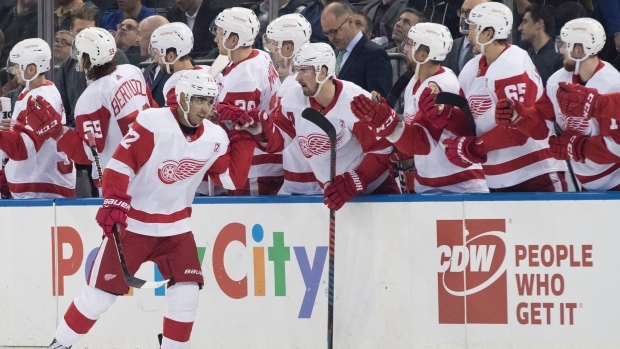 NEW YORK — The Red Wings will miss the playoffs for the third consecutive year, but they're trying to develop a strong foundation for next season. Nielsen opened the scoring at 17:16 of the first period when he held off defenceman John Gilmour and sneaked a wrister past Lundqvist. Hirose and Brian Lashoff assisted on the play. NOTES: Detroit's de la Rose left the game early because of an accelerated heartbeat. He was taken to a local hospital where he was to spend the night. ... The Rangers recalled Vinny Lettieri and John Gilmour from Hartford. Gilmour leads AHL defencemen with 53 points (20 goals, 33 assists). ... New York's Jesper Fast missed Tuesday's game with a lingering upper-body injury. The alternate captain has frequently missed practice while playing through the injury. ... The Rangers scratched F Connor Brickley, D Frederik Claesson and F Boo Nieves. Detroit scratched F Ryan Kuffner.